Do you know what Computer Chair is? 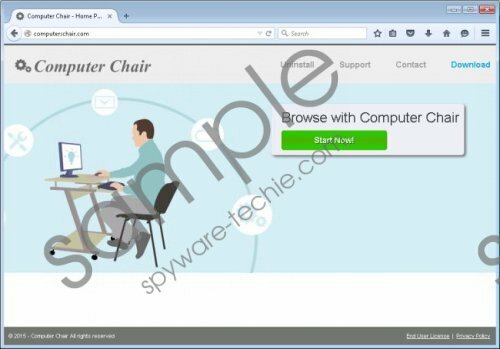 Computer Chair functions in a very similar way to other adware programs that were developed by the infamous SuperWeb LLC group. Just like its counterparts, this adware will fill up your web browser with numerous third-party commercial ads and annoying pop-ups as soon as it gains access to your PC. This is because the ad-supported program triggers multiple connections to adware servers that are the primary source of all the unwanted third-party web content. It goes without saying that such invasive activity will ruin your online activity, as all the third-party commercial ads and annoying pop-ups will be presented to you in an utterly random way. If that were not enough, at times this adware program might flood your web browser so much with those annoying ads and pop-ups that you will be forced to close them down just to be able to navigate through the web. As long as this ad-supported program is active on your PC, you will not be able to surf the web the way you are used to. It is important to remove every single bit of Computer Chair if you want to stop the intrusive activity; otherwise, the annoying ads and pop-ups will continue to bother you. Unfortunately, during the research something much more alarming about Computer Chair has been discovered. We have noticed that some ads provided by this invasive adware program could be implemented with redirect links. This is a very dangerous situation because just by clicking on a simple ad provided by this infectious program you could be taken to a suspicious third-party website. You could end up on a website with an active arbitrary code execution exploit, meaning that just entering such a site is more than enough to get your PC infected with some unknown malware. If you wish to maintain a system that is clean and secure at all times, make sure not to waste any time, and conduct a thorough removal of Computer Chair. By now it should be more than obvious why we advise you to remove Computer Chair without any hesitation. It is imperative to remove every single bit of Computer Chair since just a few leftover files or registry entries could be used to restore this invasive adware. If you want to be sure that every single bit associated with Computer Chair has been removed, we advise you to conduct an in-depth analysis of your PC after executing the manual removal. Select Computer Chair and click the Uninstall button. Click the Start button and then select Control Panel. Double-click Computer Chair and confirm that you want to remove it. If you wish to remove this adware application in a quickest way possible, you should follow the instructions that we provide below. This removal guide is crafted so the infectious program would be removed in an automatic way. Tags: Computer Chair removal, Computer Chair virus, delete Computer Chair, remove Computer Chair.